Are you ready for our Creativity Series this week? We're going to have homework so I hope that you're excited to get to work! Hey, it's all about YOU and your personal benefit so no complaining! :) For those just catching up, the first week of our series discussed the benefits of tapping into your childhood to figure out what you enjoyed before external influences and expectations took over. We talked about mind mapping as a good way to do that. I was beyond excited when many of you took the suggestion and pulled together your own map (thanks for showing me via your blogs and emails!). During the second week of our Creativity Series, we talked about the importance of physical activity, whether it's a walk around the block, time spent with your camera outdoors, or sweating it up at the gym - that part is up to you. Successful and productive people, happy people, are all known to have a regular exercise routine. Why do you think Oprah is so down on herself lately? She got out of her routine and the rich and powerful know just how vital routines are. Scientifically speaking, it makes you look and feel better but also helps your creativity to flow more freely -- the whole point of encouraging regular exercise. For those of you who hate exercise, replace words like "exercise" and "working out" with "brain boosting sessions" or "creative recharge time". I'm not kidding! If you are going to the gym and dread it, think of it as a creative exercise and not so much as a physical one. Am I making sense? With mind mapping and exercise on the table, let's now add to that our topic this week: Maintaining a regular journal. Intuition is our guide and I find that the more I journal the more I tap into mine. Many find that writing first thing in the morning is best and especially helpful in case you want to record a vivid dream. Others prefer to write late at night when there is less distraction. Some take journaling a step further to include magazine clippings, paint, and colored pencils, also known as Art Journaling. You can google "Art Journaling" and see hundreds of websites, books, and blogs on this topic. While there are no rules to time, place, or entry length, remaining consistent is key. I have an iPod Touch and downloaded an app called Gratitude! by Happy Tapper (Oprah loves hers) and developed by Carla Kay White. It's basically a spot where you can jot down what you are grateful for today and it stores all of your entries by date so you can go back in time to read any of them in case you are feeling like rubbish and need a reminder of the good things in life. It also gives you a daily quote that is always very uplifting and you can password protect this app so you can freely write whatever you'd like without feeling someone may read it. How can regular journaling help you become more creative? Journaling stimulates creativity by reducing the clutter in your head. Brain fog clears! Journaling eases decision making, reveals patterns, tracks progress, and allows freedom of expression in a private space where you will not be judged. While blogging can allow this freedom, there is a part of us that feels uncomfortable revealing all on the web. I keep most of my personal business to myself and though some other bloggers tend to tell all and that works for them, I am not that free with my personal thoughts and family matters because I believe that even when you think you are 'free' the moment you are standing before others you tend to edit - even if just a wee bit. I'm sure your blog and your personal journal (if you write one) look very different. I've been keeping a journal since I was 7 years old. In fact I still have at least half of them (lost a few boxes once during our relocation from South Carolina). I wrote inside of my very first diary that my friend Mindy and I had just visited my favorite stationery shop and I wrote how I used my allowance money on the Hello Kitty diary that I was writing in. I expressed how excited I was to have a diary and how I planned to write in it every single day. I also talked about how Mindy and I had to stay on the sofa where I was writing because the "carpet cleaning guys" had just left and my mother did not want us to walk around while the carpets were drying. Of course, over the years my journal entries matured along with me, I recorded everything from how awkward I felt in school gym class (I'm a klutz) to the time my mother took me to buy my first training bra and how she told me that she didn't know why they call it a training bra (I asked her why apparently), but I wrote in my journal that I told her that it's because a training bra will train them to do tricks someday. I remember she thought that was pretty funny, but at the time I was just making an innocent comment. It's a riot to read entries like that. I find lots of doodling in my journals, painful boyfriend episodes, problems with particular classes in school, and I talk a lot about decorating, flowers, crafts, and hobbies throughout them. I also wrote about how much I loved to write stories and make my own books. I definitely see patterns in my thinking, progress and failures, everything is all crystal clear. I don't feel like I lost time because I've been writing in journals since I was a child so there's no period in which I feel like my life got lost. Not everyone has journals from their childhood, which is understandable, so I'd like to encourage anyone reading who does not have a personal writing space to consider it! Keeping one as an adult is so vital to me because it's important for dealing with fears, coping with loss, handling failure, revealing patterns in thinking, all of which help to shape my future but to also live in the moment. Looking at entries just from last week is a good review for me, I can see bits of thinking that I consider flawed, errors I'd made in judgment, paths I need to straighten. I highly suggest writing in a journal! If you are not a journal person, I'd like to suggest an alternative -- listing. 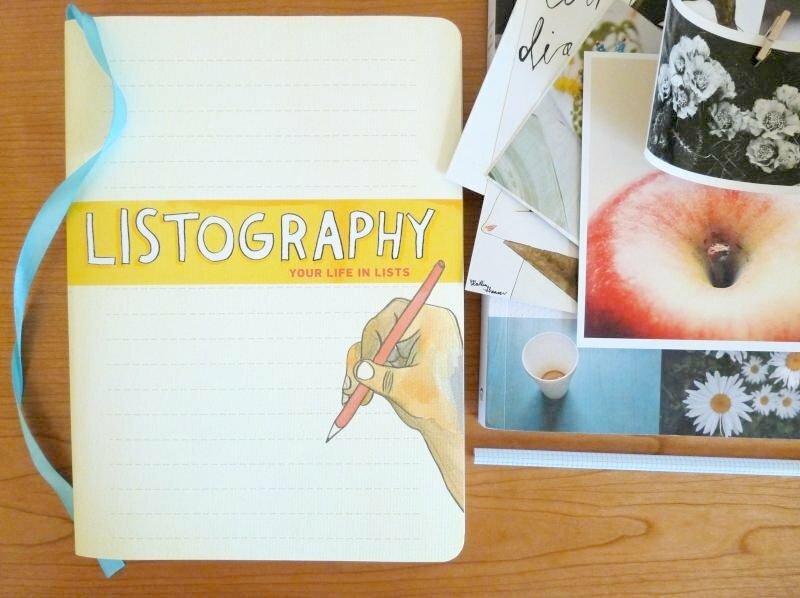 Sounds weird but there is a book called Listography: Your Life in Lists made specifically for this. I purchased my copy last April and it's fun to maintain and very revealing. I love the page: List Professions You’d Like To Try. It’s a great way to help you to open up if you're not sure where to begin. Each page of Listography asks you a question and space is provided to answer, draw, whatever you fancy. Would you like to try listing for a moment along with me here? I say go for it. List a few things that you would like to do as a profession if you knew you would not fail. Ready? Do you keep a journal? Do you want to? How has it helped you tap into your creative self?